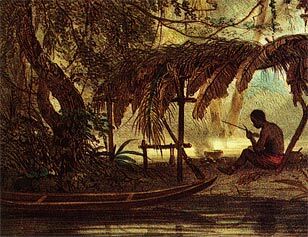 Detail from tinted lithograph of a maroon in the swamps of Surinam, original artist unknown. From Benoit's Voyage a Surinam (1839), reprinted in Bakker et al's Geschiedenis Van Suriname (1993). Wherever African slaves were imported in the Americas, some escaped. In Brazil, Mexico, Surinam, and other colonies, fugitive slaves founded rebel communities that endured for generations. The Spanish referred to the members of these communities as cimarronnes, or runaways. The British shortened cimarron to maroon, which is still in use today.